It’s possible that, if you’ve been shopping for LED lights, you’ve come across the terms constant current and constant voltage. It’s also very possible that you have no clue what those terms mean. 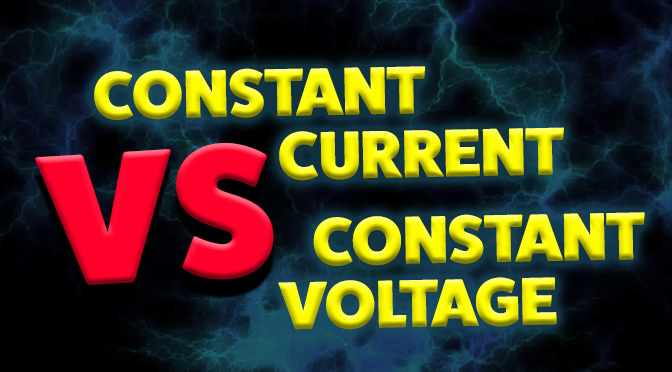 This post should clear up the confusion of constant current vs. constant voltage. LEDs typically have a power-limiting device (either driver or resistors) in order to prevent LEDs from being overdriven. A constant-current driver is used to regulate the amount of current that is supplied to an LED or LED array to maximize LED lifetime. If current is not regulated, LED brightness can fluctuate and life span can be shortened. The constant-current driver is used for LEDs or light fixtures that require a stable output current and operate within a range of voltages. Most finished LED products already have a constant-current driver or resistors to regulate current. If you’re building an LED fixture or replacing a constant-current driver, it’s important to verify that the output current and voltage of the driver is compatible with the LEDs’ current and voltage. If your LED product already has a constant-current driver or uses resistors in the LED array, you might need a constant-voltage power supply. Constant-voltage power supplies can be used to power LED products that have resistors or constant-current drivers. Products with these current-regulating devices might require a constant-voltage power supply if they need a different operating voltage than what’s supplied by the power source (home, vehicle, etc.). For example, LED light strips are equipped with current-regulating resistors. If the light strip operates within a 9-14.8-volt direct current (DC) range, it can be installed inside a vehicle with a 12-volt DC system without using a constant-voltage power supply. In order for that light strip to be installed in a home with a 120-volt alternating current (AC) wiring system, the voltage would need to be reduced and converted from AC to DC with a power supply. In some cases, constant-current drivers matching the voltage and current requirements of both the product and the power source (home, vehicle, etc.) are available, and a constant-voltage power supply wouldn’t be necessary. Do LED Lights Attract Bugs?